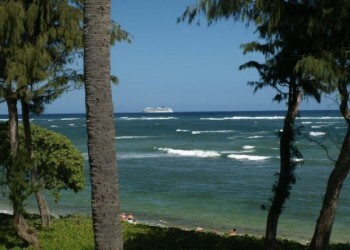 Hawaii Beaches: Hawaiian Islands, Oceanfront Beach Condo on Kauai - steps to ocean! Hawaiian Islands, Oceanfront Beach Condo on Kauai - steps to ocean! Aloha and welcome to our little piece of paradise. We offer seven non-smoking studio condo units: #115, #131, and #160 (ground level), #239 (middle) and #319, #320, and #323 (top level) for rent located in the beachfront complex Islander on the Beach in Kapa’a, Kauai, HI. They are located on six lushly landscaped oceanfront acres. Each condo features a lanai where you can enjoy beautiful sunsets and ocean views and each are only a few strides away from your own private beach. Please add 13.4% taxes, a $65.00 non-refundable cleaning fee and a fully refundable $100.00 security deposit. We will give discounts to stays longer than seven nights. Our rates are already tough to beat so with the further discount for stays longer than seven nights, you can’t go wrong! As you can see, we DO NOT raise our rates for specific holidays, summer, winter, etc. Our great rates are constant year round. Direct Oceanfront Beach Condo on Kauai - steps to ocean!